We have been breeding St. Bernards in the heart of the Tyrolean mountains since 1975. Our kennels are located on a detached mountain farm, where we are often snowed in from november to april and are often not able to leave the farm for a number of days. This normally means hard work and stress for us humans. For our dogs however, who live under the same conditions as the St. Bernards on the Great St. Bernard Pass, that is not in kennels, these conditions are ideal. All our dogs run around freely. Their thanks are the many wonderful prizes that they win, including 3 world champions, 3 x WUSB winners, 4 x European champions as well as numerous national and international champions. But above all they thank us with good health and a long life. I also have to praise my husband, who is prepared to travel thousands of kilometers in order to cover them with the best male dogs. The St. Bernard is a big dog with a heavy head which must be in proportion to its body. Nowadays, one differentiates between the long-hair and the short-hair St. Bernard, while the short-hair St. Bernard is the original St. Bernard. As long-hair puppies have always occurred in the litters, one has continued to breed these, and the situation is that because of the attractiveness of the longer fur, the long-hair St. Bernard has been preferred, and the short-hair variety has found itself in continual decline. This has led to the fact that nowadays many people are not even aware that the short-hair St. Bernard even exists, and we are always amused when we take part in shows and exhibitions and people ask us what breed our dogs are. As I breed both long and short-hair St. Bernards, and therefore have the unique position of being able to compare them, I would most certainly choose the short-hair St. Bernard as far as vitality and health are concerned. What could possibly be more handsome than an excellent short-hair male dog presenting himself in all his strength and beauty. Because of his short fur the tiniest imperfection becomes visible and cannot be covered up through long fur Furthermore, the short-hair St. Bernard is better suited to us here in the Alps where there is a lot of snow, and contrary to the long-hair St. Bernard the snow does not stick to its fur and it is better suited to the surroundings. As we know from numerous reports about the Great St. Bernard Pass in Switzerland, the short-hair St. Bernard was used in avalanche disasters to search for survivors or to find people lost in the mountains. They are still used in certain parts of the Alps for this purpose. Finally, with reference to the beautiful St. Bernards, I would like to add that many mistakes have been made in the past as far as breeding is concerned. The main reason being that the emphasis was laid on breeding bigger and heavier dogs, whereby the health of the dogs was ignored, the result now being that many dogs are unable to walk. Because of hip-displasia as well as a short life expectancy (heart problems) and other illnesses, we have now been forced to take action. Therefore the trend nowadays is undoubtedly towards a lighter dog which is more agile and can move well. The head should be noble and the skin smooth and not wrinkled, the eyes should be dark and lozenge-shaped. The body should be supple and elegant. 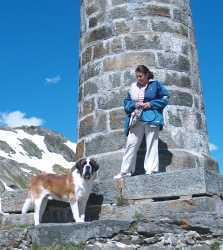 The St. Bernard is an alpine dog, and as such must reflect this and it is high time to give preference to this type of dog. The heavy molloch types with their wrinkled heads, tired expression and clumsy movements should be excluded from further breeding as much as possible. Finally, I would like to wish all St. Bernard fans all the very best and lots of fun with their dogs. Should you ever come to the Tyrol, you will be most welcome to come and visit us for a good cup of coffee and a snack and to stay with us for a few enjoyable hours with our St. Bernards. Please give us a call beforehand to make sure that we are at home.